Gender politics continues to be top of the agenda for political and business leaders. In recent weeks, Theresa May was accused of sexism for mentioning “boys jobs and girls jobs”. The Harvard Business Review published a study which highlighted a radical difference in the language used to describe men and women candidates by Venture Capitalists when evaluating investment proposals. And the BBC’s influential Woman’s Hour programme featured a debate which asked “Should women avoid making tea to be taken seriously at work?”. It appears that gender bias and stereotypes are still a very real workplace issue in 2017.
Business ‘bottom line’ is often sighted as a key reason to take heed and develop an inclusive culture (BHP Biliton 14 Dec 2016 and Facebook 2014). The Global Women in Leadership Report 2015 underscores that ‘Women are accountable for approximately USD 20 trillion of consumer spending worldwide, which makes them the most dynamic and fastest growing economic force in the world. They are redefining markets and creating growth, which makes the business case for organisations to attract and retain women very strong.’ But perhaps it’s the subtle nuances in terms of the roles which women feel they should adopt in the workplace that might suggest a simmering ‘hidden’ culture? Or perhaps this is all just a ‘storm in a tea cup’? IDG’s recent work with clients worldwide on ‘Aspiring Women Leaders’ and ‘Inclusive Leadership’ provide an insight into these’ ‘hot topics’; what’s helping or hindering women, and therefore the business, to achieve maximum potential? Interestingly our experience worldwide with ‘female only’ audiences, in our cultural experiential exercises, indicates that women are just as competitive, ruthless, and robust as similar groups of male only or female minority groups. They are equally likely and not more likely to collaborate and negotiate. Their raw leadership potential is the same as the organisational norm. Why then are women often left to ‘make the tea’? In a 2 day IDG workshop with over 45 executive women from Jordan, organisational culture was challenged in terms of developing individual strategies for mitigating bias and stereotypes together with strengthening resilience and confidence. Discussions produced a wide-ranging list of challenges faced by professional women on the journey to be ‘taken seriously’ at work. These included; the lack of senior women in Leadership positions as role models, the Gender Pay Gap, balancing work and family, work/life balance, stigma around ‘traditional femininity’ and as Theresa May alluded to, the unconscious stereotyping of work roles as ‘boys jobs and girls jobs’. 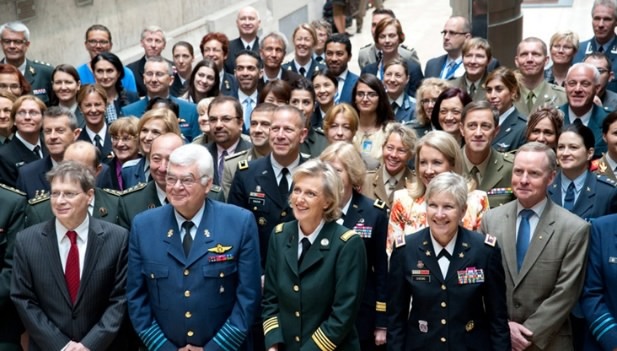 Representatives of the NATO Committee for Gender Perspectives (NCGP)with Princess Astrid of Belgium. This photo was taken in Jun 2015 to mark 15 years since the inaugural ‘platform for action’ in Beijing was signed and United Nations Security Council Resolution (UNSCR) 1325 was signed on Women Peace and Security in which gender equality is the key objective. The author is in the third row, third from the right. Significantly, women’s own perceptions and behaviour, their lack of confidence and the underestimation of their true worth were also noted, echoing the ‘double edged sword of having to ‘prove it again’ coined by Joan Williams in her Gender Bias Learning Project http://www.genderbiasbingo.com/. The lack of tactical networking – the support of a ‘Boys club’, leaves women at a disadvantage; one which positively tends to benefit men’s careers only. These challenges are not new. They are sited in feminist and mainstream literature. In my role as the Deputy Chair NATO Committee on Gender Perspectives (NCGP), I conducted research during a focus group with senior NATO males and females in June 2015. It revealed a similar set of challenges and barriers, with the issues of masculinity an added dimension to integration. And again, as a Gender Advisor in East Africa (Uganda 2016), women sited similar barriers to advancement. One senior female Warrant Officer explained how she had to kneel in front of her husband at home performing a traditional ‘female’ role serving food, and yet was a respected, robust authority once back in barracks, wearing her uniform and performing a traditionally ‘male’ role! These barriers echo global findings; the Global Gender Report 2015 listed the top 3 barriers to performance advancement as balancing work and family, stereotypes/bias, and lack of confidence. IDG has experience of delivering leadership solutions across organisations worldwide which address these issues. Firstly, women’s empowerment (through developing confidence, communications, networking, negotiating and brand challenges) and secondly Inclusive leadership. The latter develops transformational leaders who strive to challenge organisational culture, by encouraging diversity of thought, with personnel from diverse backgrounds, and diverse perspectives. This can foster innovation, maximise employee engagement and make the most of the potential of their people. But there’s also an onus on women themselves. Leadership is not about masculine or feminine traits but about creating a unique authentic leadership style. Women need to embrace inclusive leadership, confident in the strength of ‘soft power’ and their emotionally intelligent niche. Equally, they should be just as comfortable taking their place at the table, shedding years of stereotyping in which they had to conform to ‘girls jobs’.